The AMD Ryzen 5 2400G is the first APU to get us giddy about integrated graphics with the ability to play games at 4K and high-quality settings. Before Ryzen, AMD was best known for its incredibly affordable Athlon APUs. Many of these system-on-a-chip units, combining processor cores with onboard graphics, went into affordable gaming PCs and home theater PCs. So, when we went a complete year without any Ryzen-based APUs, we were a bit disappointed. We’ve taken AMD’s claims to the task and came away amazed by the chip’s ability to game at 4K and high-quality settings without having to plug in a graphics card. Combined with slightly improved processor performance and an amazing price, the AMD Ryzen 5 2400G is one of our favorite chips that’ll work for many affordable PC builds. The $169 (£149, AU$269) AMD Ryzen 5 2400G arrives to replace the Ryzen 5 1400, one of the most value packed 4-core/8-thread processors, which released last April at the very same price. In this way, the 2400G is the definition of getting more for your money. Not only is it a faster processor built upon a matured Zen architecture, there’s also the onboard Vega 11 graphics. Though its 11 compute units that clock up to 1,250MHz might not sound very impressive compared to Kaby Lake G’s minimum of 20 compute units flying at 1,011MHz, the Ryzen 5 2400G got us plenty excited with playing Overwatch at 4K – more on that soon. This processor also has a ton more integrated graphics muscle than Intel’s competing Core i5-8400 and Core i3-8350K – priced at $189 (£189, AU$259) and $169 (£159, AU$239), respectively. You can buy and AMD Ryzen 5 2400G at Newegg and Amazon in the US, Scan and Overclockers in the UK, and PLE Computers in Australia. Not to be confused with Ryzen 2nd generation, the processor side of AMD’s Ryzen APUs are still part of the Zen architecture that made the original Ryzen processors a legend. But, that’s not to say this is just a freshly printed Ryzen 1400 processor with an integrated GPU. 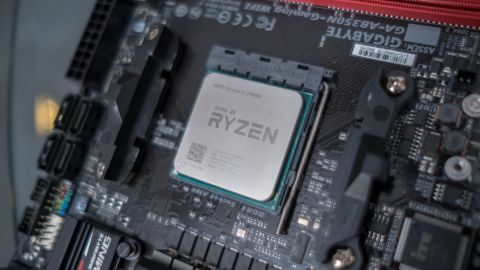 Thanks to AMD’s new 14nm+ process and Raven Ridge architecture, the Ryzen 5 2400G runs at a 0.2GHz faster base clock, and the chip’s boost clock has also been increased by a factor of 0.5GHz compared to its predecessor. Beyond that, AMD promises its new Raven Ridge design also reduces cache and memory latencies, helping the processor to perform faster with all workloads – especially gaming. One down note of the Raven Ridge design is that the type of supported PCIe lanes has dropped from x16 to x8. This hasn’t really limited the speed of NVMe SSDs or high-end graphics cards in our stable, but it could stunt the growth of your PCs if components become exponentially more powerful and faster in the near future. Looking at how the AMD Ryzen 5 2400G performs compared to its predecessor in our benchmarks, Cinebench shows greater multi-threaded performance, while GeekBench reveals better single-core performance. Improvements on these two fronts ultimately lead this chip to transcode video in Handbrake at a steadier rate than the Ryzen 5 1400. Unfortunately, even with AMD’s year-on-year processor performance improvements, it still can’t match up to Intel’s processing prowess. The Intel Core i3-8350K runs away with significantly faster single- and multi-core scores in both GeekBench and Cinebench (using an aggregate or results found on the web). Meanwhile, the slightly more expensive, but hexa-core, Intel i5-8400 simply blows away both the quad-core processors. The good news is AMD’s Vega integrated graphics are leagues ahead of Intel UHD graphics. Whereas we were lucky to run Rocket League at over 10 frames-per-second (fps) at 640 x 480 resolution with every graphical setting turned all the way down on an Intel Core i5-8400, we had an absolutely playable 30fps experience on the AMD Ryzen 5 2400G with the game set to a 1080p resolution and high-quality settings. What’s even more impressive is we were able to kick the graphical quality settings in Overwatch to ‘Epic’ and the resolution to 3,840 x 2,160, and still get a completely playable 30fps experience. Only Destiny 2 proved to be too much for the AMD Ryzen 5 2400G’s integrated graphics, in which it had a rougher time staying at 30 fps with occasional drops to 15 fps while playing the game at 1080p and high quality settings. Unfortunately, during our testing we ran into an issue of getting the AMD Ryzen 5 2400G to play nice with the Nvidia GTX 1080 Ti we use for testing. Due to pre-release drivers, there were complications between the ‘discrete-class’ Vega graphics and any actual discrete graphics card we tried to plug in. We’re working with AMD to resolve the issue quickly, and will update this review with further gaming benchmark results. The AMD Ryzen 5 2400G’s temperatures also don’t see as an amazing improvement. Rather, the processor hits a higher peak of 56-degrees Celsius, thanks to integrated graphics churning away right next to the processor cores. Last year, we thought the Ryzen 5 1400 was an amazing value for a quad-core, eight-thread processor, and now the $169 (£149, AU$269) AMD Ryzen 5 2400G is an even better deal. The processor might only perform slightly faster than the last generation, computationally speaking, but the strength of AMD’s onboard Vega graphics is astonishing. Whether you’re looking to build a compact home theater or just starting on an eSports gaming PC, this is the perfect APU to buy. What’s more, you can truly skip getting a graphics card with this chip – especially in these terrible times with cryptocurrency mining inflating the prices on all graphics cards. With that, the AMD Ryzen 5 2400G earns our Editor’s Choice award.